Features of the kit include a detailed crew access ladder, optional open or closed canopy, removable intake and jet pipe covers, optional armament, and fuel tanks. Also included in the 222-component kit are positionable elevators, ailerons, rudder, flaps and air brakes. 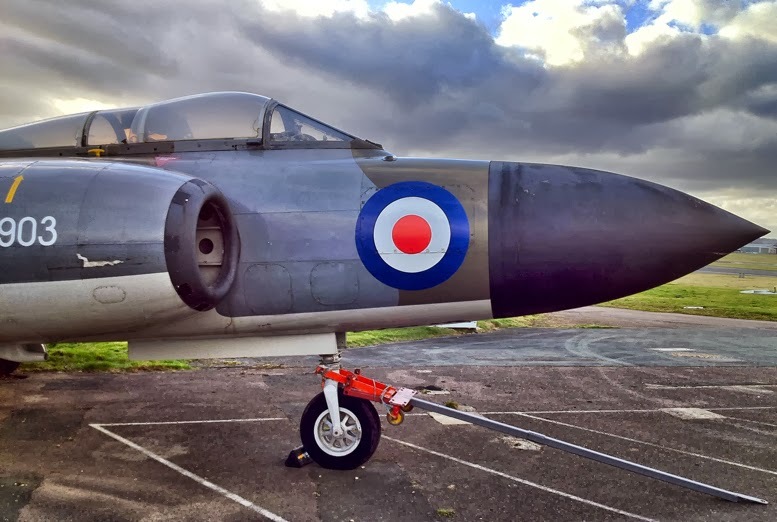 When assembled, the Airfix Gloster Javelin measures 402mm (15.8in) long, with a wingspan of 332mm (13.1in). The Gloster Javelin was developed in the 1950s as a two-seat, all weather interceptor. 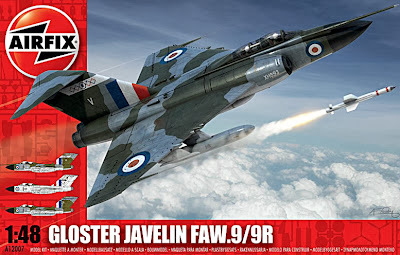 The Javelin served with the RAF during the late 1950s and much of the 1960s, and was the last aircraft designed and built by the Gloster aircraft company. The Javelin had a broad-chord delta wing, and a large T-tail. Cannon and missiles were carried, typically four De Havilland Firestreak infrared heat-seekers, though budget issues meant that two of these could be concrete dummies, which at least served to fool Soviet spy-photo interpreters. The Cold War never turned hot, so Javelin crews didn't have to fire those dummy missiles. However, Javelins did fly combat patrols over the jungles of Malaysia, and in 1964, an Indonesian Air Force C-130 Hercules crashed, while trying to evade a Javelin homing in on an intercept course. Javelins were also deployed to Hong Kong and Zambia. 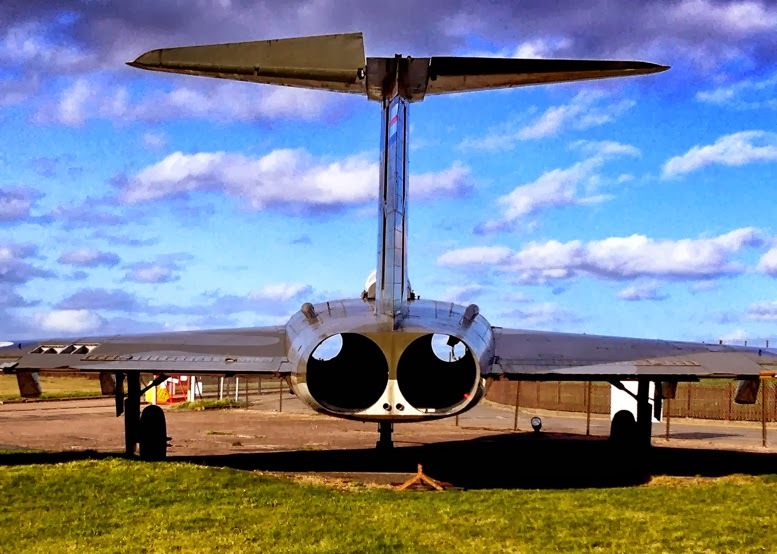 The last aircraft (of 435 built) was withdrawn in April, 1968. 1: Gloster Javelin FAW 9R, No 64 Squadron, Royal Air Force Tengah, Singapore, 1960s. 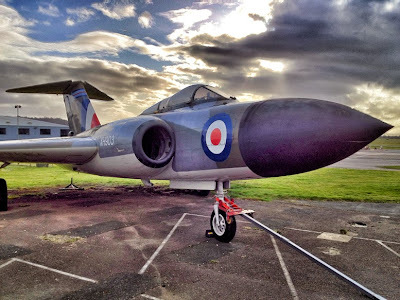 2: Gloster Javelin FAW 9, as flown by Squadron Leader George H. Beaton, Commanding Officer, No 228 Operational Conversion Unit, RAF Leuchars and Binbrook, 1966. 3: Gloster Javelin FAW 9/9R, No 33 Squadron, RAF Middleton St George, County Durham, England, 1962. 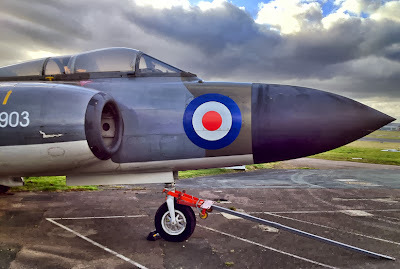 This aircraft is now preserved at the Jet Age Museum, Gloucestershire Airport, Staverton, UK, where I took the pictures (above) and (below). Incidentally, if you go to Staverton and feel hunger pangs, make a beeline for The Aviator Restaurant - great place, tasty nosh, free wi-fi, plus excellent views across the airfield, apron, and flightline. Airfix 1:48 scale Gloster Javelin available here.